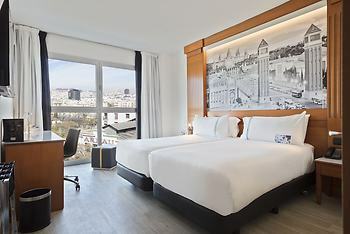 TRYP Barcelona Apolo Hotel, Barcelona, Spain - Lowest Rate Guaranteed! With a stay at TRYP Barcelona Apolo Hotel, you'll be centrally located in Barcelona, steps from Sala Apolo and Barcelona Arts on Stage. This 4-star hotel is 0.5 mi (0.8 km) from Maritime Museum and 0.6 mi (1 km) from La Rambla. This is the second time we have stayed at the Tryp Apolo and both times and have been enjoyable. We would definitely stay and recommend the Tryp Apolo to any of our friends. The hotel was very nice and the price was great. Location is just a few short blocks away from the rambla or waterfront with subway stop right in front. The hotel was in great condition and rooms were very nice. Staff were very helpful and friendly as well. I would absolutely stay there again! Location and comfort of hotel. Second stay there and highly recommend. This is an average, business class hotel but not really designed for the business person. The internet is phenomenally expensive; my room was one of the few with a balcony (hooray) but it faced onto a very busy street where partying went on until 6 am so sleeping was a problem. The room had no drawers for storage and a wardrobe whose doors threatened to jump off their track every time I used it. The coffee shop is next door and not the most salubrious of places. However, the breakfast is superb, and there is a metro station right outside so its location is excellent. The Ramblas is no more than ten minutes walk away - but be wary of thieves, who are rampant in this area. My experience was that they work in pairs, with one of them distracting one person while they steal the other person's wallet or bag. The breakfast and the convenience of the metro station outside. The cost of the internet, and a lack of storage in the bedroom. Very clean hotel and close to all the great sites of Barcelona. Check in was quick and efficient and reception staff were curtious and very helpfull. We were generally pleased with our one day stay , less than 24 hours. Front desk staff was efficient and we were able to check in at 10:00 am . The room was comfortable and clean. Pleased to receive extra toothbrush and razor etc. Excellent to be close (next) to the Metro entrance and bus line. Walking distance to Hop -On -Hop Off buses. Location, close to Metro and bars, restaurants. Everyone very nice, very helpful, beautiful hotel in great location. Logos, brands, and other trademarks featured within this site are the property of their respective trademark holders. These trademark holders are not directly affiliated with Hotelsone. Tryp Hotels by Melia is a registered trademark.© 2001 - 2019 Eurobookings. All rights reserved.